For reasons we don’t totally understand, Michael Silver at Yahoo! 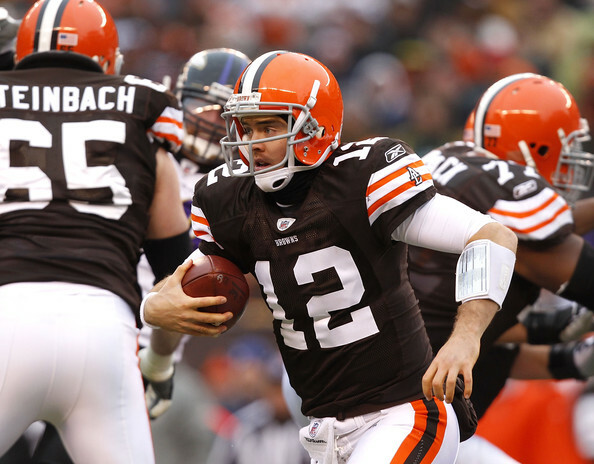 Sports decided to revisit the story about how Daboll treated Browns quarterback Colt McCoy during his rookie season. And even though it seems odd to bring this up again – it made sense the week before the Miami game – that doesn’t make it any less disturbing. In what became a running joke in the Browns’ locker room, Daboll disparaged McCoy loudly and relentlessly – sometimes to his face, sometimes through the earpiece in the quarterback’s helmet. Now we’re getting somewhere. With team president Mike Holmgren and general manager Tom Heckert calling the shots, the power base of coach Eric Mangini and Daboll had dwindled. Unable to talk back to the bosses, Daboll decided to pick on the Holmgren-selected rookie quarterback instead. Because that’s what bullies do, and there’s no way to classify Daboll as anything other than a bully. The fact that McCoy was the All-American quarterback from a major college football power, while Daboll was one of the worst offensive coordinators in the NFL, probably played a role as well. As to where Daboll got his sense of entitlement from, who knows? He, of course, would not talk to Silver for the article. To his credit, and showing the kind of mental toughness you want in a starting quarterback, McCoy took the high road when Mangini and Daboll were shown the door after a second consecutive 5-11 season. McCoy may not be the answer at quarterback for the Browns, but he definitely proved he is the better man in this situation. One thing we probably need to do is stop reading these kinds of stories. We are so tired of talking about last year and what was, to some, the brief Camelot of the 10-22 Mangini era. Those days are gone and, thankfully, they are not coming back. Camelot? Who in the world are talking about? I know I know…the guy who thinks Mangini was a good and decent person. After this story I have lost all respect for coach. There is no way to explain or justify this kind of bullying and overall bush league tactics. Maybe Grossi was right all along! Mangini was a goof in over his head! Great Article again. I just don't see where Daboll gets off acting like that; it's not like he's had any success at the NFL level. And we're very pro 1st Amendment here. All opinions are welcome and we fully support everyone's right to have their say.